It’s not uncommon for people to get baffled by the challenges and uncertainties thrown at them by life, in both professional and personal fronts. How to be happy all the time, is money the answer to all problems in life, is there a magic formula to win love from your family or how to stay ahead of the competition in the work front…the challenges are endless. Many a time, we just stand there staring at the puzzle called life, yearning for a guide to shepherd us through testing times. 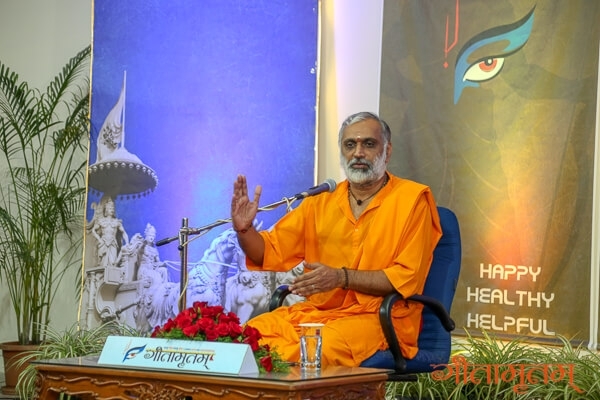 Everyone everywhere goes through testing times and the Bhagavad Gita was revealed at such a time of crisis, on a battlefield. The ancient scripture that came into existence many millennia ago still inspires people around the world to rise up in the battlefield of life and find happiness in their pursuits. 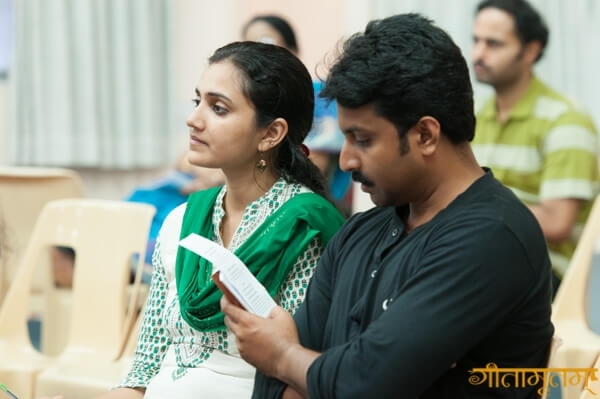 The participants who attended the Bhagavad Gita classes found them to be soul-stirring, refreshing and revitalizing. 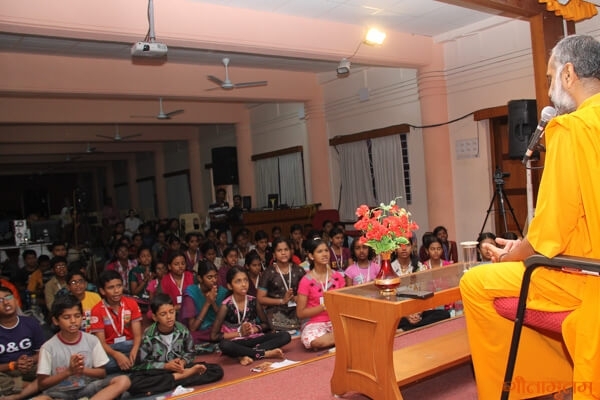 People had very dramatic experiences during the sessions, like Ms. Gayathri Sarmishta, who felt the session to be like a movie where her life was played in front of her eyes. The unique experience has given her a unique perspective to look at the life and make a balanced judgement. 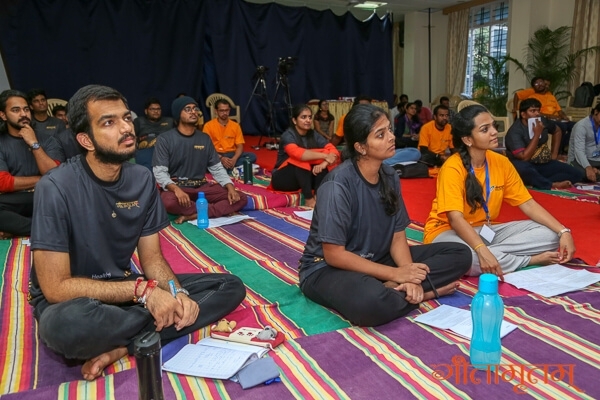 ‘’The session was an enriching experience that filled my heart with true courage to face even unpleasant incidents with composure’’, Gayathri said. 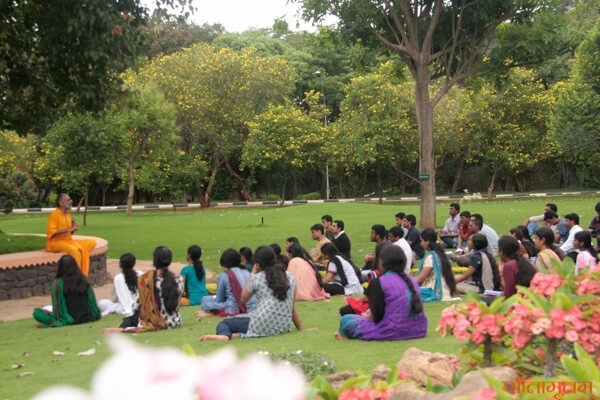 The classes were very engaging and the experience was very enriching, observed Ms. Preetha Sampath who thought the session empowered her to live life with a different perspective, face it like a game with 100% effort, enjoy it as much as she could and accept the results with equanimity. 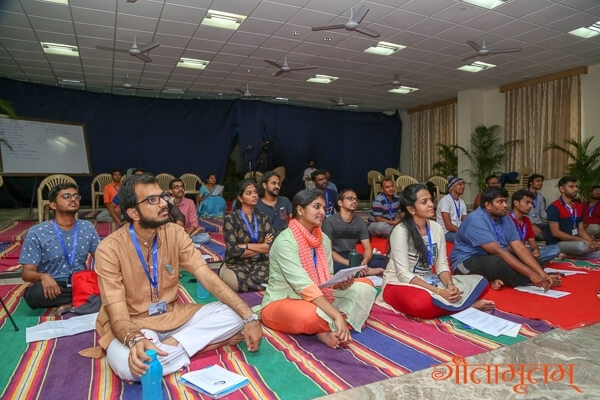 Getting clarity on the human thinking and acting patterns helped him a lot, said Mr. Abhishek A Ahuja who was all praises for Dhyanji for the spectacular session.’’ He reads prescription shlokas from the book of Dr. Gita and tells us what is the way to act, think and what is the motivation for all our actions.’’, stated Mr. Ahuja. 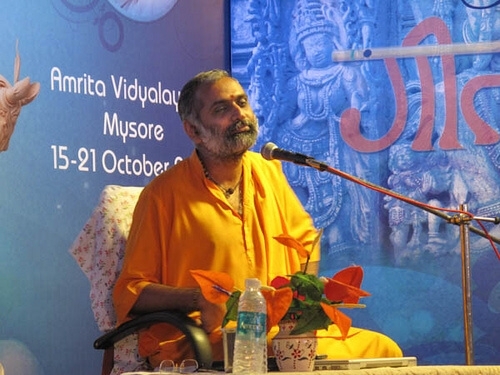 He went on to say that the session taught him to put his worries aside and continue with his Karma. 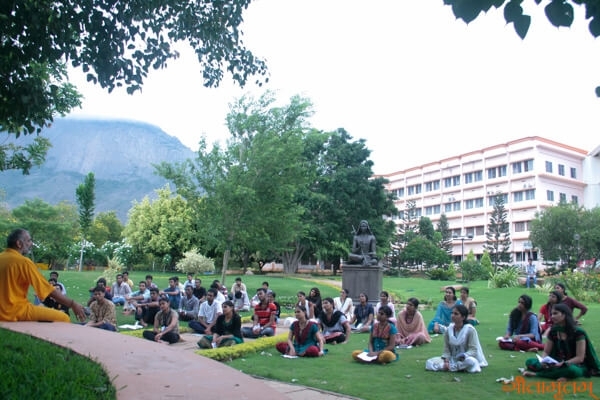 The participants found the classes to be life-altering experiences and everyone was keen to return the next year. Br. 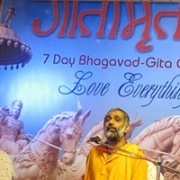 Dhyanamrita Chaitanya gave the class on Bhagavad Gita. 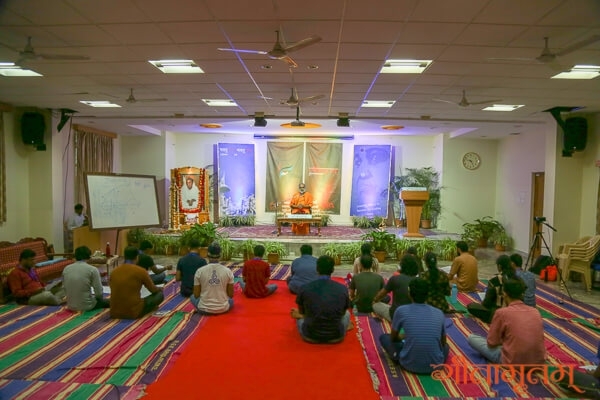 The 12th Chapter – Bhakti Yoga was explained to the students. We discussed the idea of setting up the right goal in life, the values needed to achieve that and the qualification required. 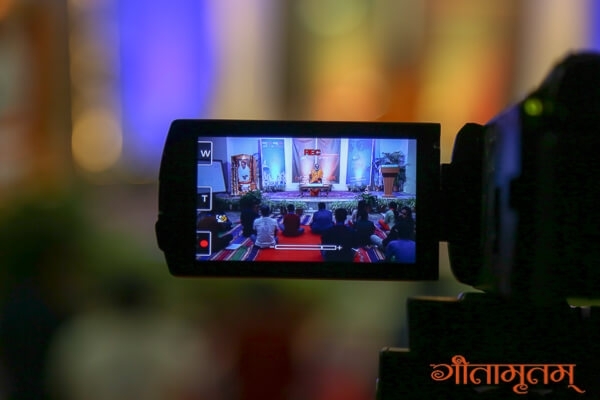 ‘Who is a devotee in the eyes of the Lord’ was really an eye opener for many. 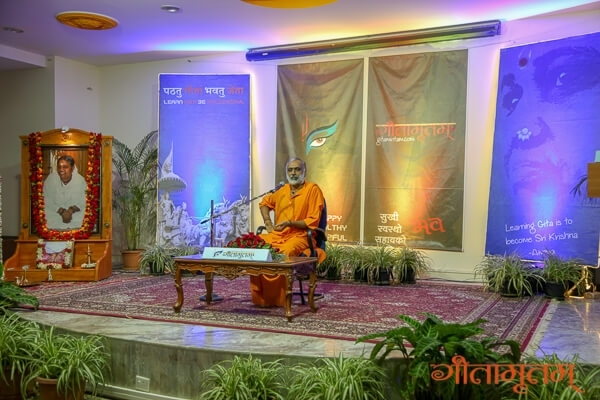 His simple and lucid style with jokes, anecdotes and real life examples made every one understand the essence of Gita. I came for the camp with some facts and information but didn’t have conviction. At this juncture, I’m inspired and convinced. Please excuse me for using a cliche but I feel,”known is a drop and unknown is an ocean”. 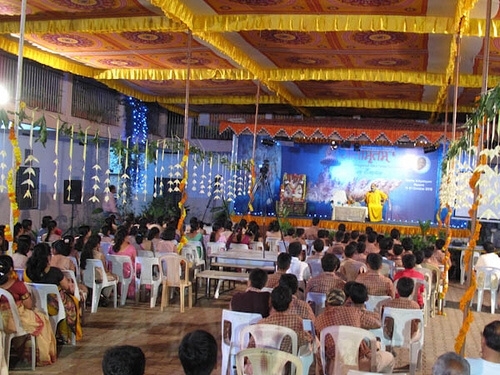 The Sri Krishna hall turned into a new world where real ideas were born. The given time and space was not enough for what all we learnt. 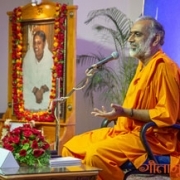 (Gitamritam team please do consider this). 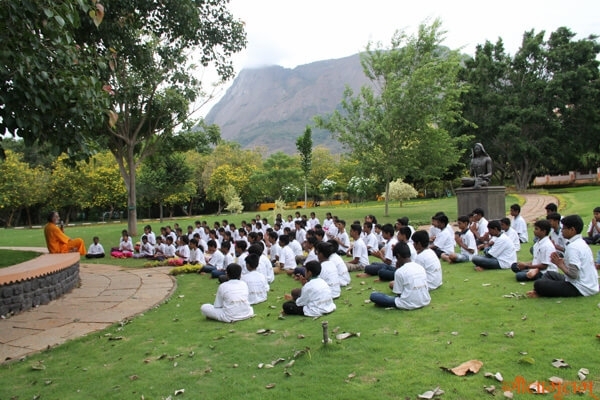 Our monkey minds were mesmerized, captured under the perfect guidance of Dhyanji. I am ever indebted to you for everything and for building a “new me” and you will continue to inspire me on all basis. 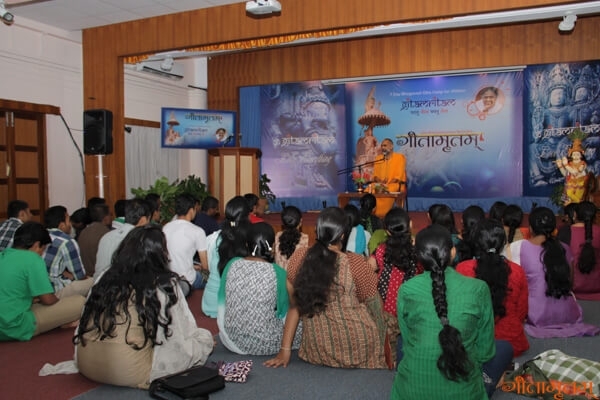 The thoughts of “mine” and “myself” just got tattered off with Swamiji’s enlightening classes. Now I know the purpose of my life – “to stay happy”. Classes were amazing. Now I understand what is happiness. In a human life both happiness and sorrow have equal importance. I learned how to withstand a critical situation. Really this will be a memorable event for me. It was a wonderful experience. 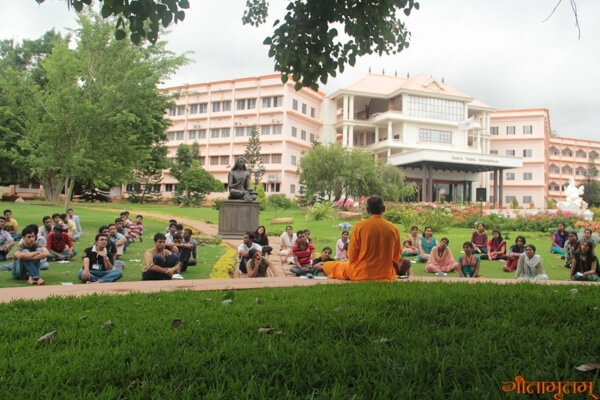 It helped me a lot in boosting up my confidence and I believe that all the things that I learnt from the camp will help me further in my life, in all the spheres. I appreciate and am grateful for all the efforts put forward by all those people who had a great hand in making this camp a great success. This has inspired me to learn all the other chapters of Bhagavad Gita. 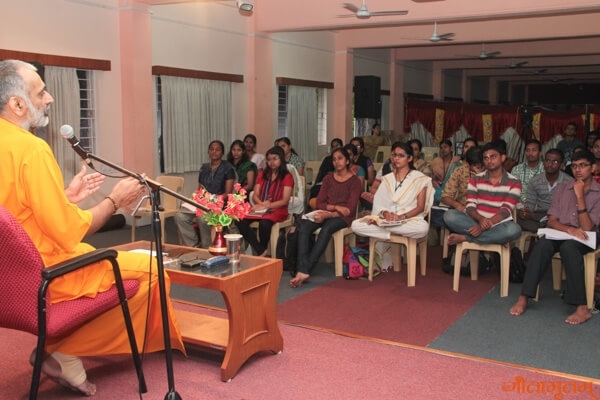 In the Bhagavad Gita classes, I have cleared many of my confusions in my life. Sometimes I lack spiritual base, that is when I go out of track and fall in pit of confusions and I become sad that I have not reached anywhere. But now the 12th chapter of Gita has changed my perspective of looking into life. I can go back to the world and live peace fully in adversities. 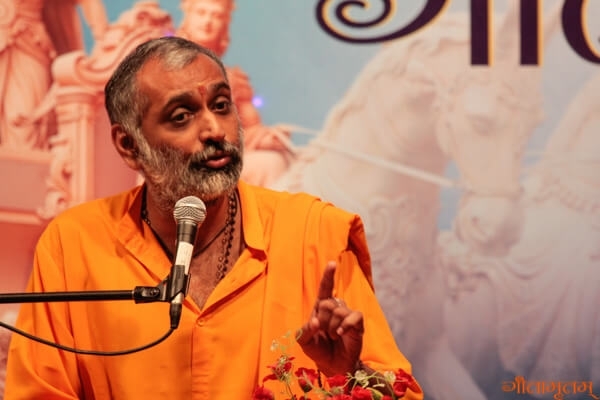 Gita has taught me to centered to the truth always and not to the external environment. 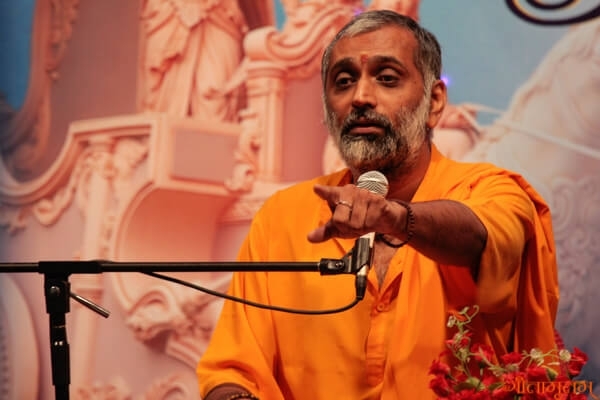 Be detached, at the same time see the God or truth in everything you see outside. May I be the sweet instrument in the hands of the Lord. The class has open my eyes to a new world. I was under great regret in every step of my life. The class has open doors in my life to make it happier. A place where I rediscovered myself. What I am and what all I should change in me to make me and the world around me a happier place to live in. Before coming to the camp I had a period when I did not know how to handle my relations. I got really confused about many feelings and new aspects of life as I became mature. 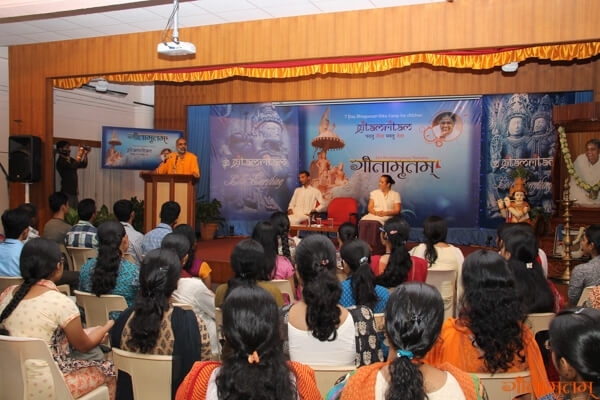 Gita – the life science, answered all my questions, even though I myself did not know what they were. It taught me how to be happy. 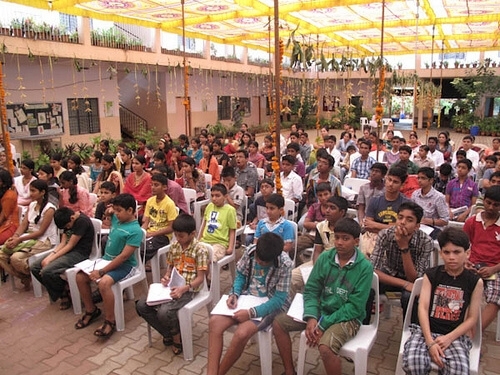 Bhagavad Gita classes were interesting. 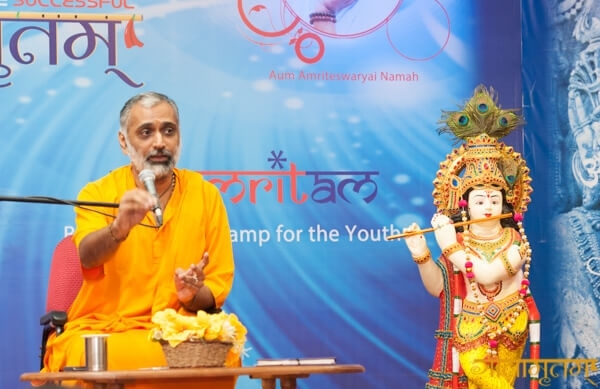 Dhyanji teaches the values of Gita with real life and practical examples. 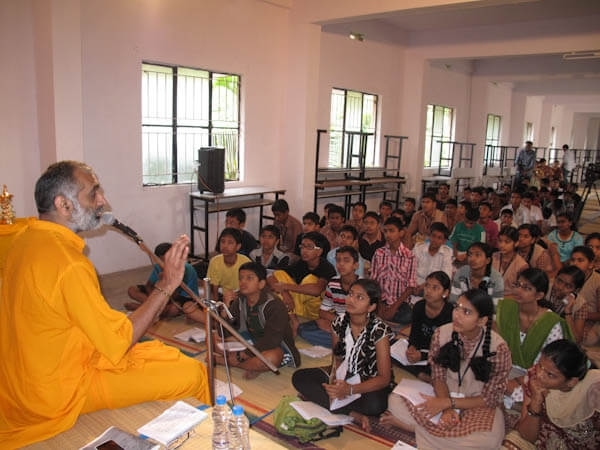 More over Dhyanji enjoys teaching. It helped me a lot to polish myself. 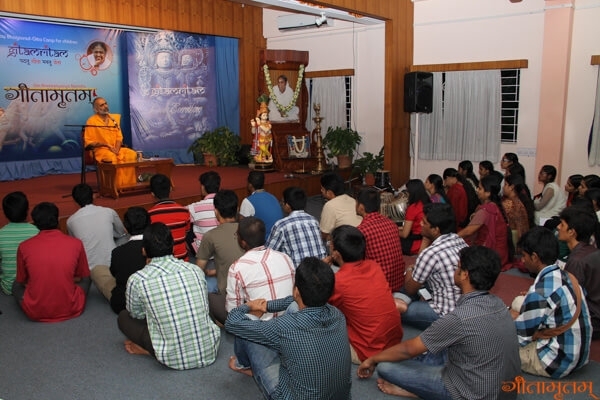 Gita class helped me to realize who I am and what real happiness is and how to make the balance in our life. I really found out what my mistakes are and why I was not able to overcome those. Now I’ve got the answer for all my errors and I’m going to follow it. 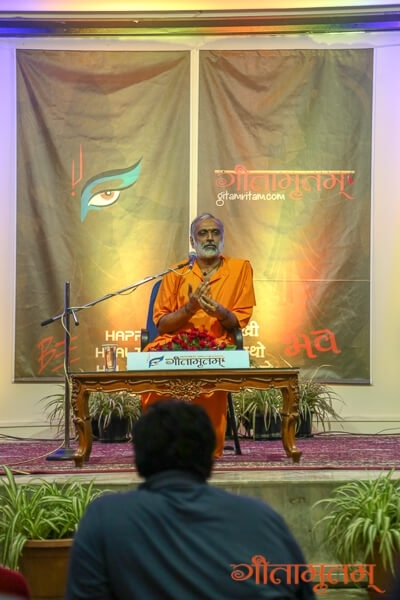 It was a very good experience with Dhyanji. He taught us with patience. I got to learn about life. 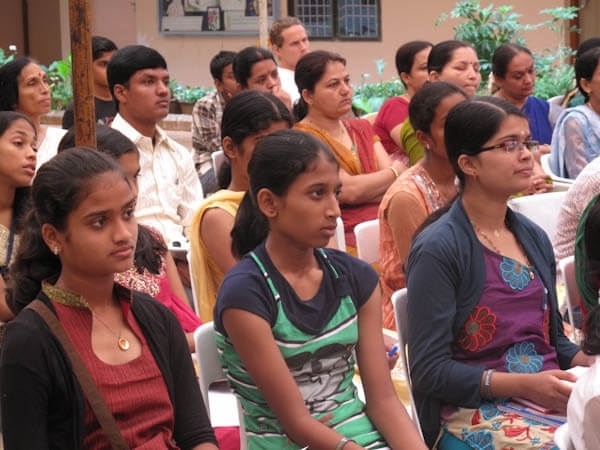 When I heard about the Gitamritam class I was not interested and my parents force me to come. When I came here I thought that it will be boring for me, and will not have any friend. But, when I came here I was the youngest one and everyone liked me and looked at me like a small brother. 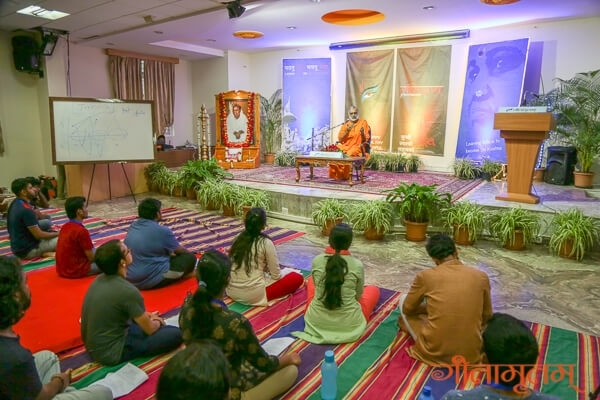 I thought that they will teach us only Gita, it will be very boring, but the classes was very interesting and through the Bhagavad Gita classes I learned more important things which I didn’t expect. Now I have learnt to live my life. 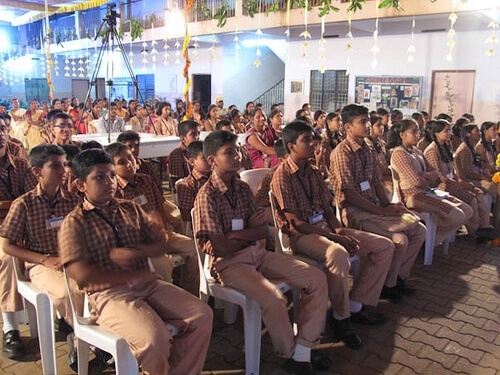 From this class I learned that it is important to set goals in life and also to have belief in yourself. Was good. 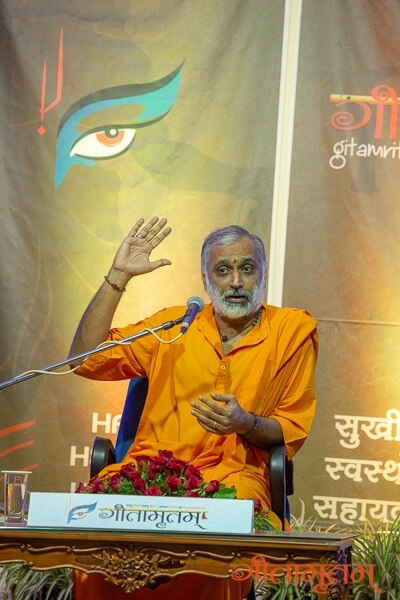 Got to know the fundamentals of Gita and came to know what Bhakti yoga is all about. Got to know the true meaning of who is a ‘devotee’. Got to know the important things which are a must for a person to be happy irrespective of the circumstances. and I came to know what is ‘love’. 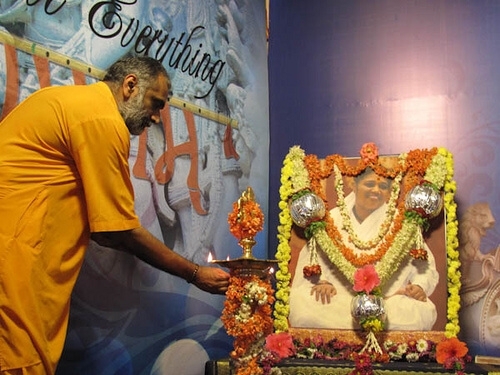 If we consider Gitamritam team is the whole world, our love is equal to Amma and I am feeling it. I am feeling the transformation within myself. Br. 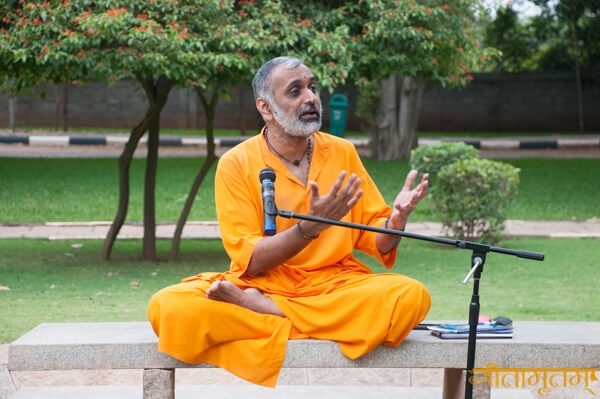 Dhyanamrita Chaitanya gave the class on Bhagavad Gita 12th Chapter – Bhakti Yoga. What is love? What is devotion? 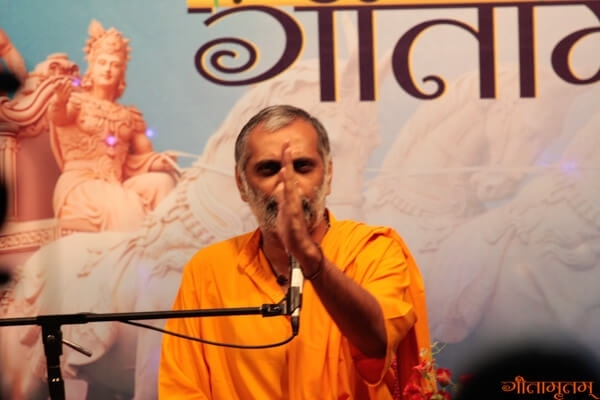 Who is a devotee? What he/she will be like? – all were discussed in details. 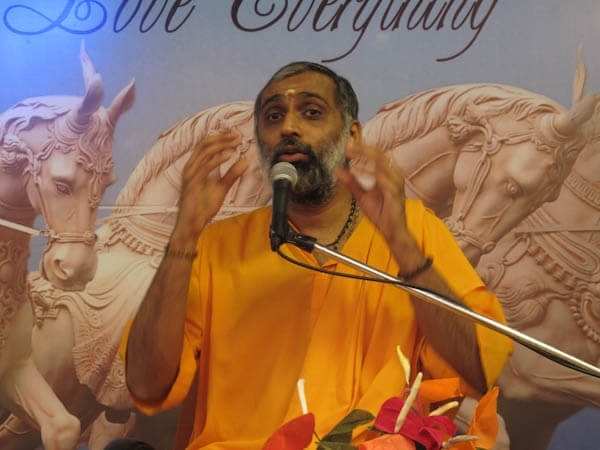 ‘Who is a devotee in the eyes of the Lord’ was really an eye opener for many. 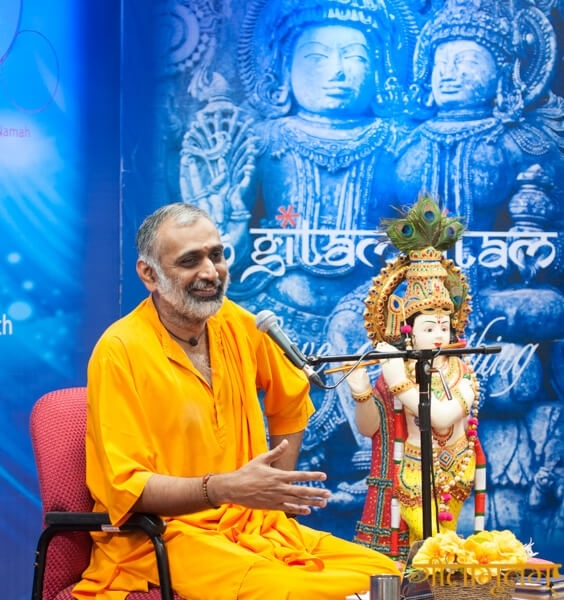 His simple and lucid style with jokes, anecdotes and real life examples made every one understand the essence of Gita. 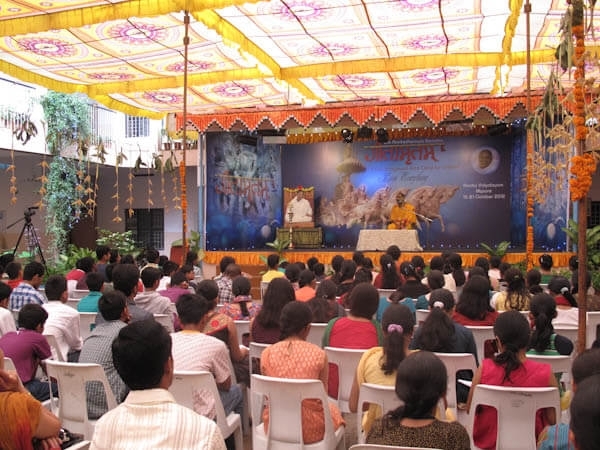 This classes helped many to understand the necessity to learn Gita and the need to imbibe its values for a happy life. 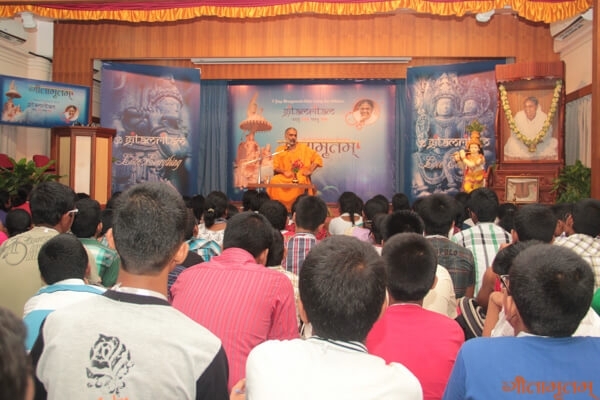 I never expected Bhagavad Gita classes to be so creative and enjoyable. 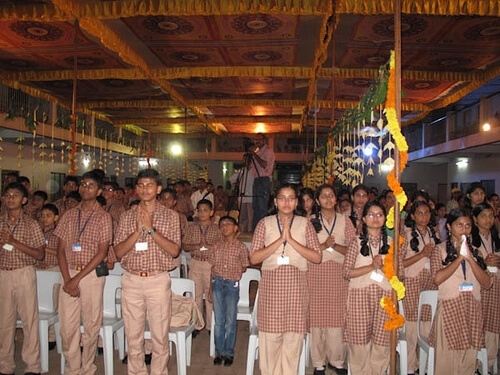 I felt each and every minute idea of Gita to be a gem, which is priceless. I found the love what I missed for a long time and I got aim for what am living in this world and why I was not able to finish anything. And now I know who am I. And my ultimate aim is to be happy, so I will be happy. 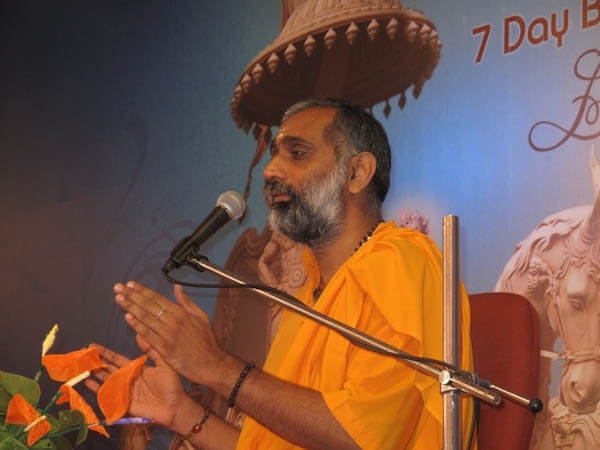 Thank you Swamiji. I am excited not because I am leaving the camp. But because after this we are gonna start a new life! 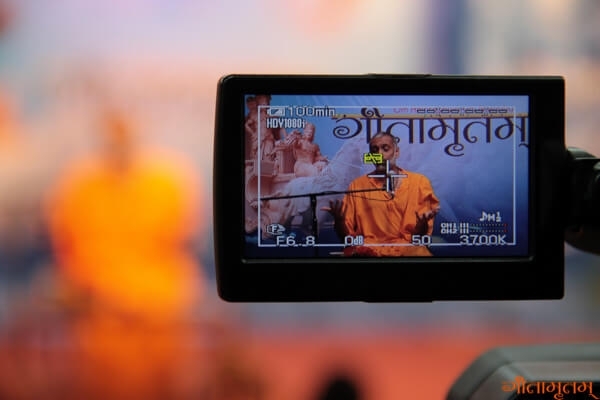 The actual application of Gita’s concepts starts. It taught me to live every moment to the fullest and that too with a smile. Really an eye opener. I feel like being Krishna. I think now I know the meaning of love and I have started to love everything. I never expected a Gita class can be like this. From these classes I realized myself. I feel so happy after attending this class. 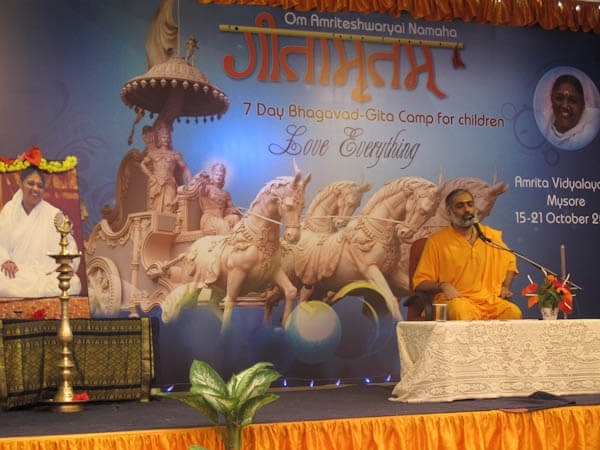 I never thought that Gita can be taught in such a way. Before attending this class I was not knowing my goals, or purpose for what I am living. Now I have fixed goals and purpose to be happy always. The part of the camp that has been the most worthy of being in the camp, has lead us to introspect a lot into ourselves, really worth. It’s a lifetime opportunity to get ourselves into the right track. 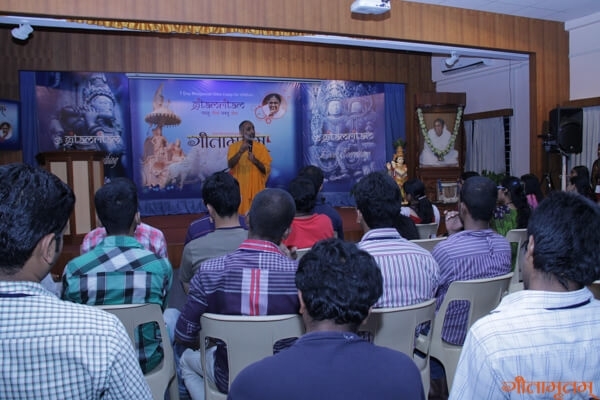 Swamiji thank you!! The classes were very good and I cleared my doubts. The examples given were understandable and easy to digest. It was really very interesting and I have learnt how to live the life. It was very helpful to know what was the purpose of our life. Truly it touched my heart and will say that these days, at the end of the day I realized that I was happy and completely occupied. 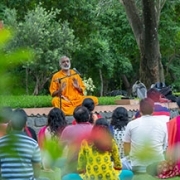 In Bhagavad Gita classes I had understood what ‘I am’ is not what ‘I am’ but it is a changeless substratum called Iswaran, and that in this world everything is changing. 4. I must be the master of my senses and not let the senses be my master. 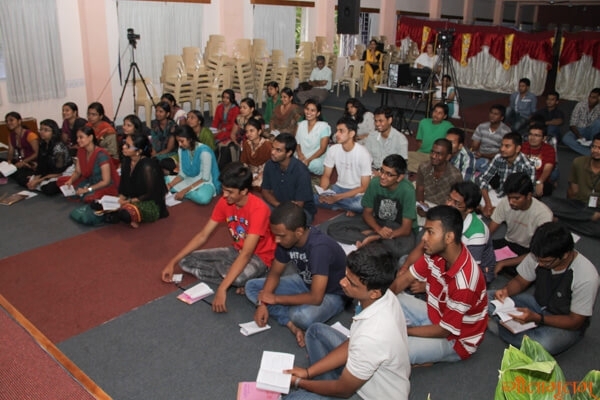 From these Gita classes we learnt how to lead our life happily, with satisfaction. I like this class more because it teaches us how to be and the way the life should be. It was so good and informative, taught me how to lead a life happily. It was taught in our level, very simple and appropriate. This knowledge was very necessary for me at this point of time in my life. I realized what were important things in life. 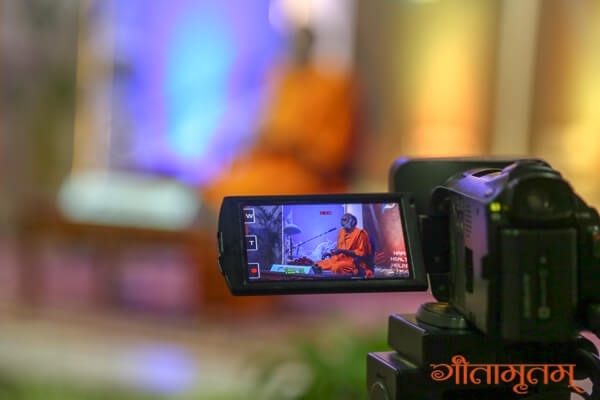 Thank you so much Dhyanamrita Swamiji for making it so simple. I thought it would be boring but after attending I learnt how to live the life. 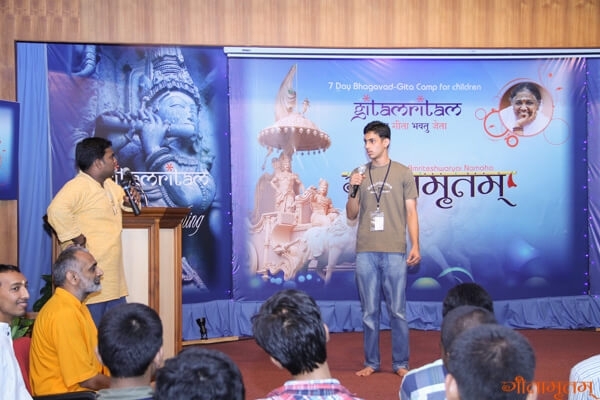 I learned lot of things from Bhagavad Gita. I think whatever I learned I can apply in my life. Amazing! It was like opening the treasure chest. Dhyanji, thank you. 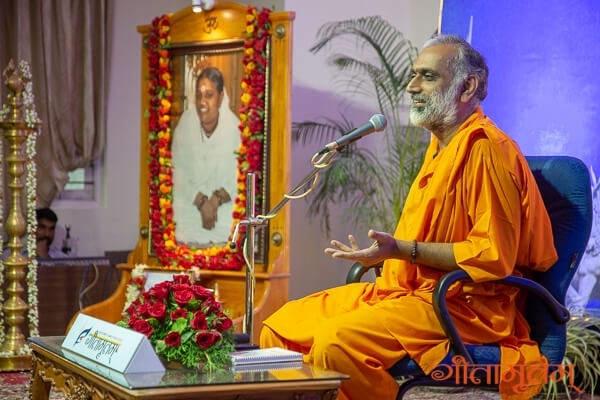 We came to know about who a real devotee is, that change is inevitable, happiness is the ultimate goal of our life and that creation is not different from creator. This couldn’t be termed as a class as we found a family here. I learned what I am, what I am supposed to do and how to achieve my goals and stay happy. I’d love to attend more classes if I am fortunate enough and would be extremely glad if this was possible. 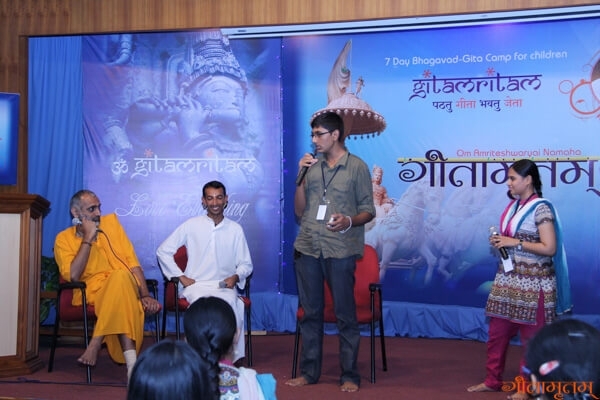 Thanks a lot to Gitamritam family for giving me this unique opportunity to know more about myself. I promise I’ll apply what I’ve learned from these few pleasant days in my life and make it worthwhile. Helped me in regaining my self confidence and made me decide my goal in life. 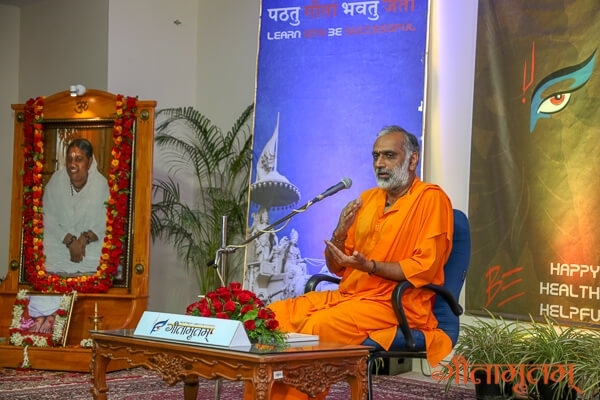 Firstly I was interested in learning Gita and Gitamritam gave me the best path to make my journey of life very easy with happiness. 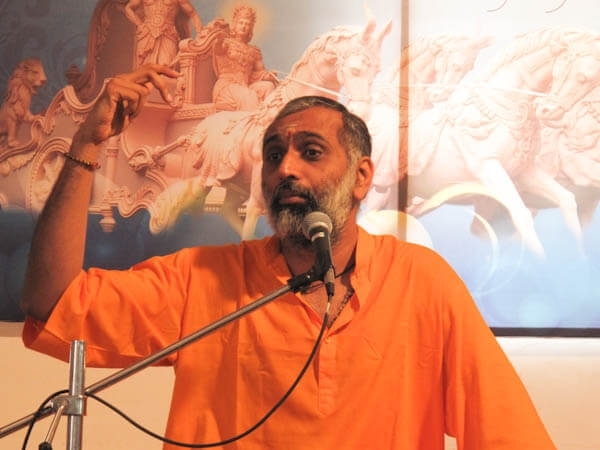 Actually I did not know about Gita and I have not read any thing about Gita. 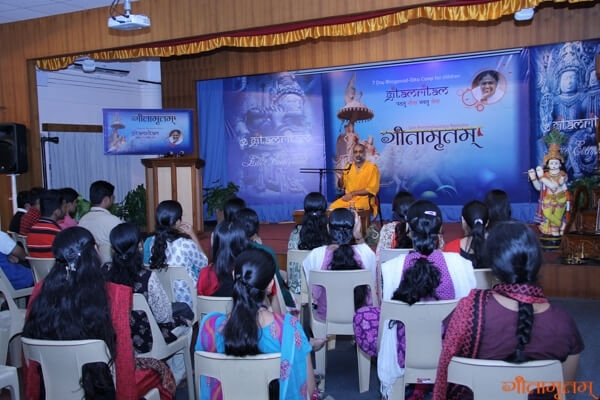 After coming here and attending the classes of Gita I have learnt so many things and the most important thing is how to lead a life. 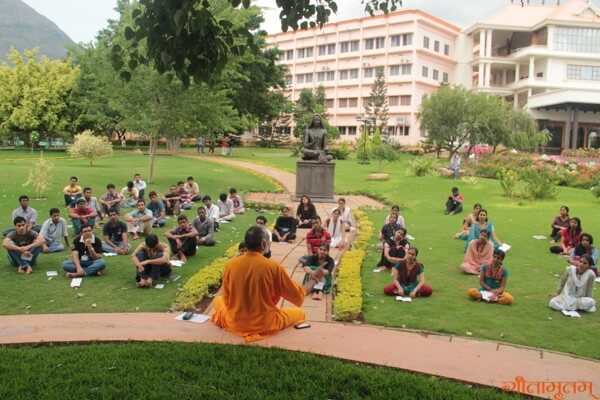 With the blessing of Amma, the first ever camp for the youth, to lean Bhagavad Gita was conducted from 1st June to 8th June at Amrita University Campus, Coimbatore. Br. 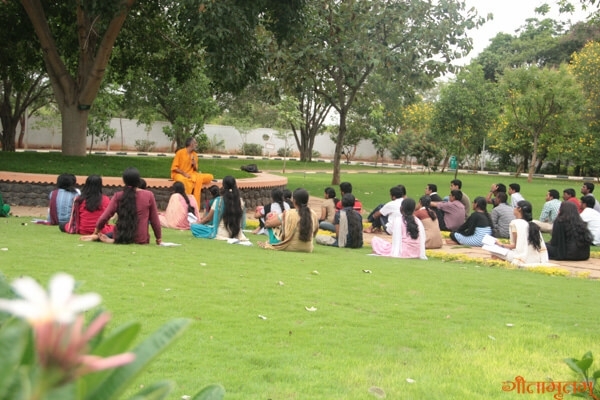 Dhyanamrita Chaitanya gave classes on Bhagavad Gita 12th Chapter during these 7 days. 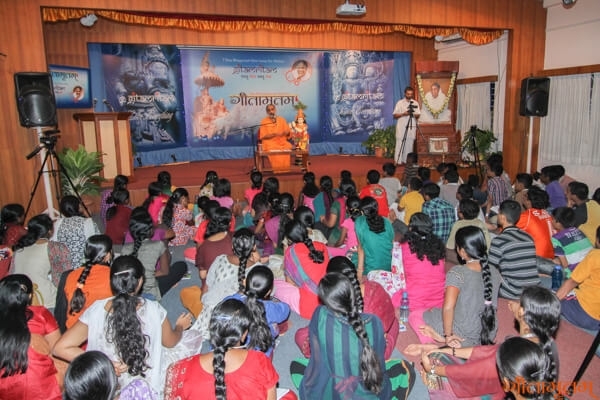 He gave 3 sessions on Gita every day. 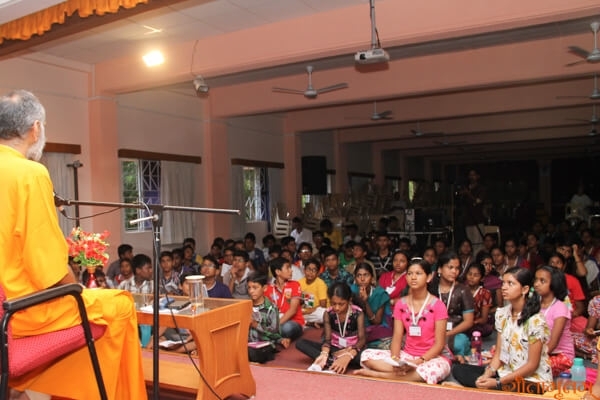 The children were made to chant the slokas, taught the meaning and its application in daily life through different examples and activities. 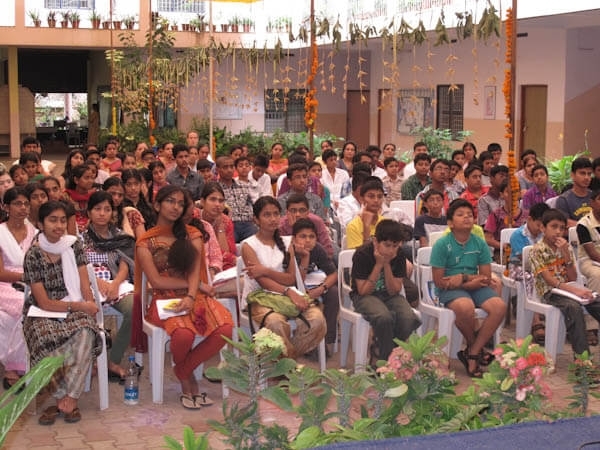 He inspired the children to live the values Gita is advising. 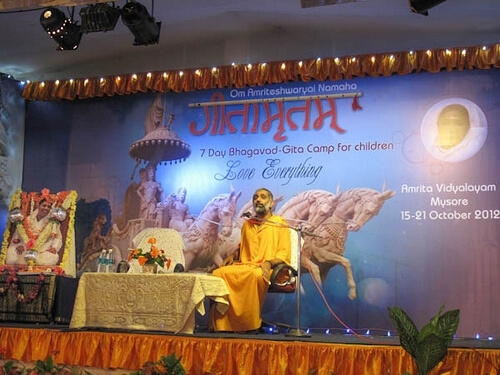 After attending this camp, I think “GITA” as mother. 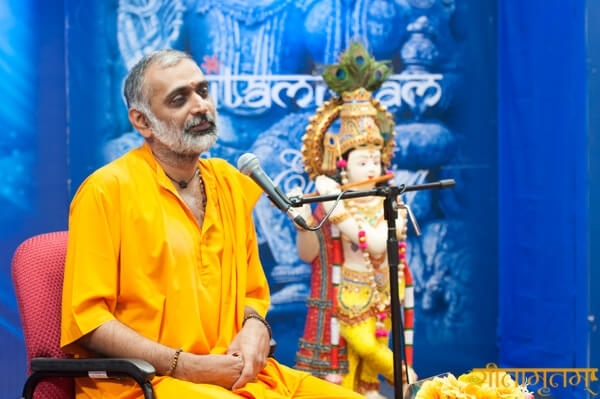 I have successfully learned 12-chapter and about true devotion (bhakti). – M.J.Subashini. 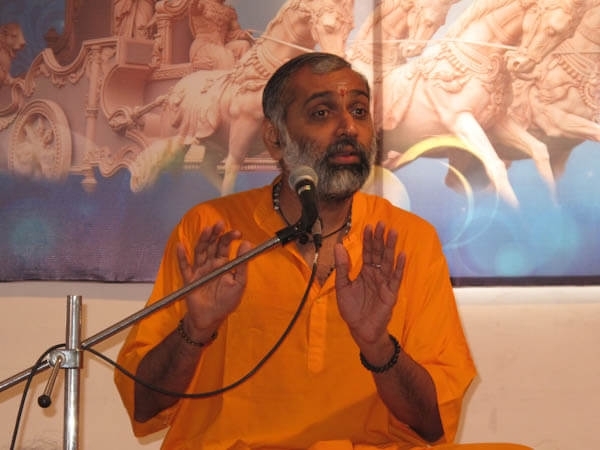 GITA IS MY PASSION, GITA IS MY INSPIRATION. Hereafter I will definitely change the life, and i will try to teach GITA for my friends. Br. 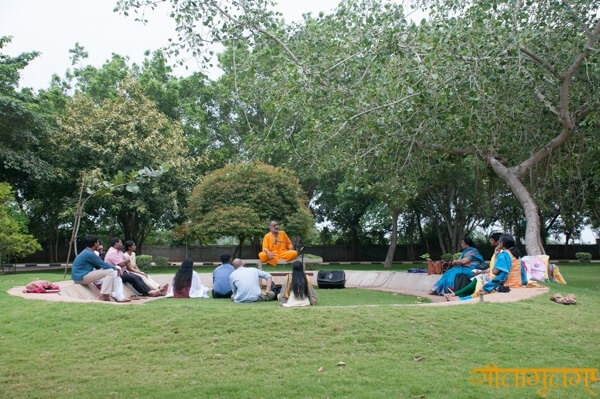 Dhyanamrita Chaitanya gave Bhagavad Gita class two sessions daily and some times three. 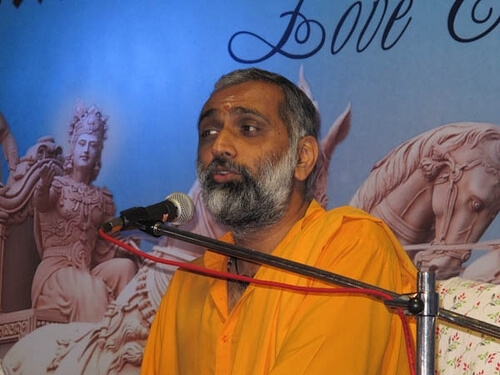 He took the Chapter 12 – Bhakti yoga completely. 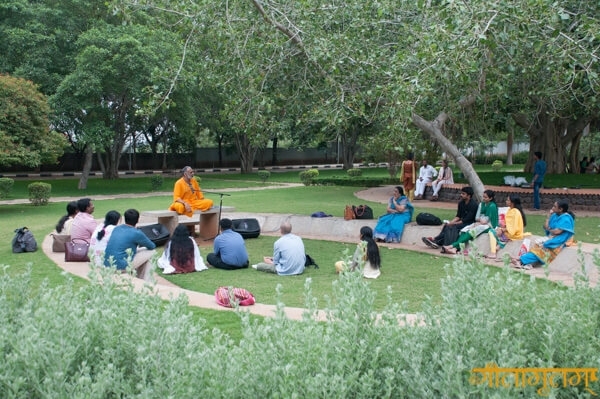 By the end of the camp all came to know how to chant, the meaning and its application in daily life. 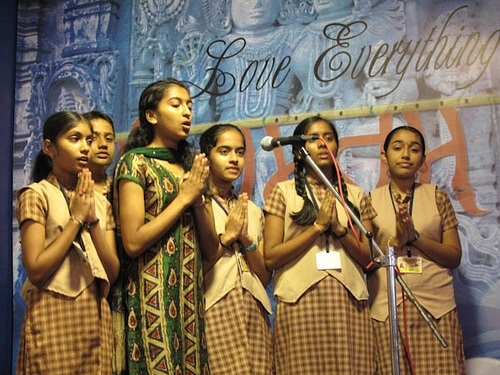 The theme of the camp was ‘Love Everything’. 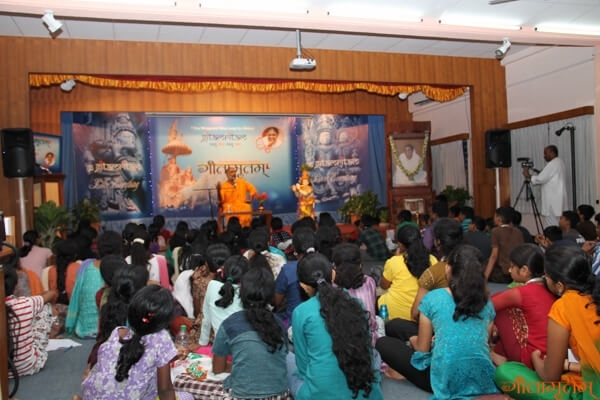 108 students form all over Karnataka Amrita Vidyalayams’ participated in this 7 day residential Gitamritam camp. The children were very reluctant to leave the camp on the 7th day. 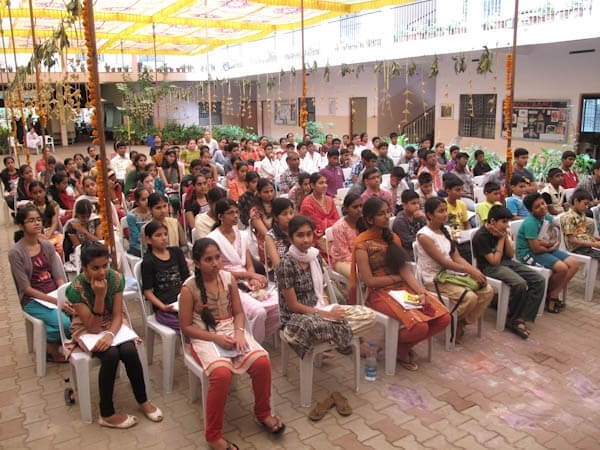 Some feedback of the students ..